Organ Trio at the Robin’s Nest this Sat. I just wanted to let you know my organ trio with Jared Gold and Steve Williams will be playing this Sat. Feb 4th 9:00pm – 1:00 am at The Robin’s Nest in Linden, NJ. See my itinerary page for directions. It’s my first time there, I hear it’s a cool, funky place. I hope to see you there! Posted in Gigs, News	| Comments Off on Organ Trio at the Robin’s Nest this Sat. Hello everyone….just a note to let you know that I’ll be playing at the Bar Next Door tomorrow night Wed. Feb 1st at 8:30 and 10:30. It’s at 129 Macdougal /West 4th. Jared Gold on organ, McClenty Hunter on drums and myself on guitar. We’ll be playing some new music from Jared’s upcoming Positone CD that we’re recording this Saturday. We’re also playing this Sat. night Feb 4th at the Robins Nest (3103 Tremley Road in Linden NJ) from 9-1…..hope to see you! Hi friends…. I’ve had a busy year so far and it’s just getting started. I started out the year at the JEN conference in Louisville KY and I will be posting some video’s from my concert there. I had a ball playing with my organ trio with the great Bobby Floyd on organ, Jonathan Higgins on drums and our special guest the one and only Bob Mintzer on tenor sax. 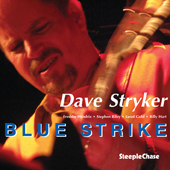 This is the same trio that is on my DVD “Dave Stryker Organ Trio Live” available only on this site. Closer to home I’m very excited about a brand new CD that I just recorded “Blue to the Bone IV”! It has been almost 10 years since the last Blue to the Bone CD and this one will be out later in 2012. It features Freddie Hendrix on trumpet, Steve Slagle on alto sax, Vincent Gardner on trombone, Gary Smulyan on bari sax, along with my working organ trio, Jared Gold on organ and McClenty Hunter on drums. We just played a great CD release gig for my current CD(also available right here) “Blue Strike” at the Jazz Standard and thanks for all who came out and packed the place. I also have some upcoming gigs I hope you’ll come out to if you’re in the New York/New Jersey area. Hello , Happy 2012 and Welcome to my new and improved Website! I hope to be a lot more interactive with everyone now. My old site wasn’t able to be viewed on Iphones and Ipads etc, so this is the new lean and mean site. We are still adding to it everyday, so keep checking in. I will be updating my news every few days, and letting you know about my upcoming gigs, and goings on. Keep coming back as were going to be adding my CD’s for sale. This is the best place to order signed CD’s, Books, and DVD’s directly from me, with no middle-man. Hope you will check back here often and keep in touch. Look forward to seeing you at the next gig! I’m playing a two-set release gig for “Blue Strike” at the Jazz Standard. The date is Wed., Jan. 18., and the sets are at 7:30 pm and 9:30 pm. I will be playing with Freddie Hendrix on trumpet, Stephen Riley on tenor sax, Jared Gold on organ and Billy Hart on drums. Come out and see us! For more info, tickets and directions, go to my Itinerary page. If you are in or near Louisville this Friday, come see the Dave Stryker Organ Trio at the Jazz Education Network Conference. The show is at the Galt House Hotel and starts at 2:00 pm. I will be playing with Bobby Floyd on organ and Jonathan Higgins on drums. For directions or more info, check my Itinerary page. Welcome to my new website. I will be updating davestryker.com in the days ahead, so come back often for updates to my itinerary and to see what’s new.